Wood Component Wrapped in Cloth Necklace Jewelry Cloth Wrap wood beads necklace collection. Product code: JWN839 - Necklace 33 inches in 4-5 mm coco pukalet black, 4mm acrylic corner clear white, coco stick 1/2 inches brown 2tones, land snail oval 24x32 mm, diamond cloth wrapping 36x36 mm, woodsaturn 10x15 mm super bleach and 18 mm beads cloth wrapping. 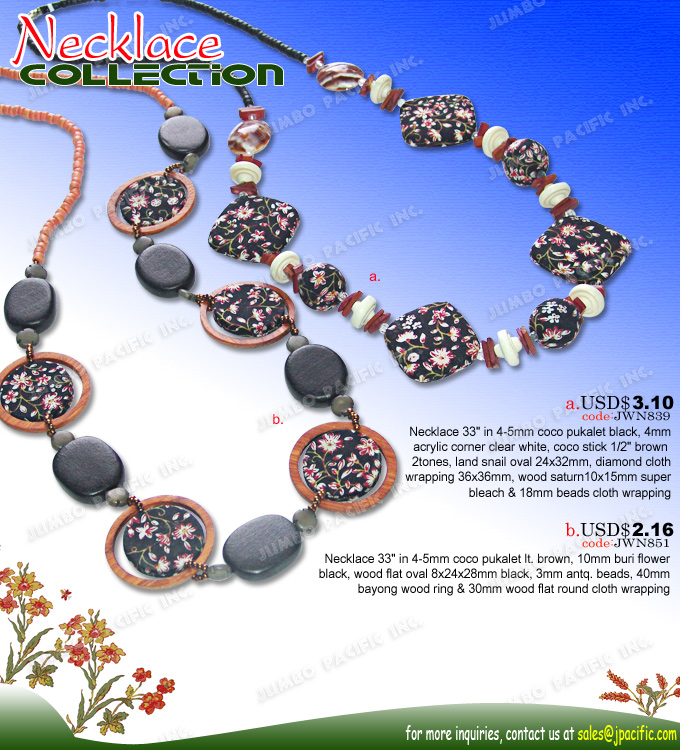 Product code: JWN851 - Necklace 33 inches in 4-5 coco pukalet light brown, 10mm buri flower black, wood flat oval 8x24x28mm black, 3mm antique beads, 40mm bayong wood ring and 30mm wood flat round cloth wrapping.